Expo '74, the first environmentally themed World's Fair, opened in Spokane in May of 1974. Native American heritage was a focus. "What more fitting theme could be chosen than an environmental exposition for the presentation of a lifestyle based on harmony with nature?" asked one brochure. This American Indian was expressed in several ways, including tepee building, traditional garments, and most of all traditional dances. 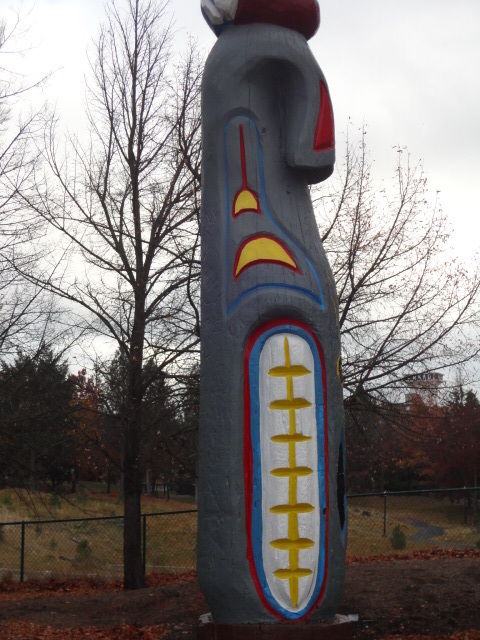 The totem poles on Canada Island are the only visible remnants of this cultural celebration which occurred at Expo '74. Canada Island bears its name because it was host to the Canadian pavilion at Expo '74. The provinces of Alberta and British Columbia went to work preparing exhibits for the environmentally themed exposition. 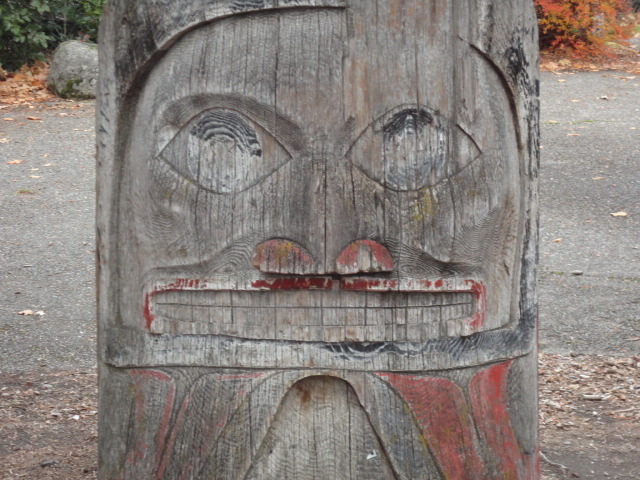 The Canadians included totem-pole carving demonstrations to highlight the native heritage of coastal peoples. 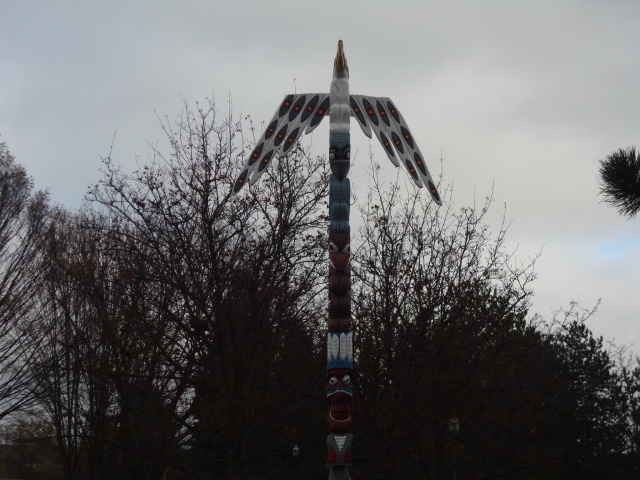 Traditionally, totem poles can have many different functions or themes, ranging from images that represented the origins and lineage of a people, to supernatural experiences. To keep with the overall theme of Expo '74, totems were constructed which emphasized the environmental heritage of native North Americans. Participants of Expo '74 watched these totem poles being constructed in traditional fashion. This was a long process which included stripping the bark and adzing away the sapwood, removing knots and other defective areas, drawing designs with charcoal and carving, then adding any appendages such as wings or arms. 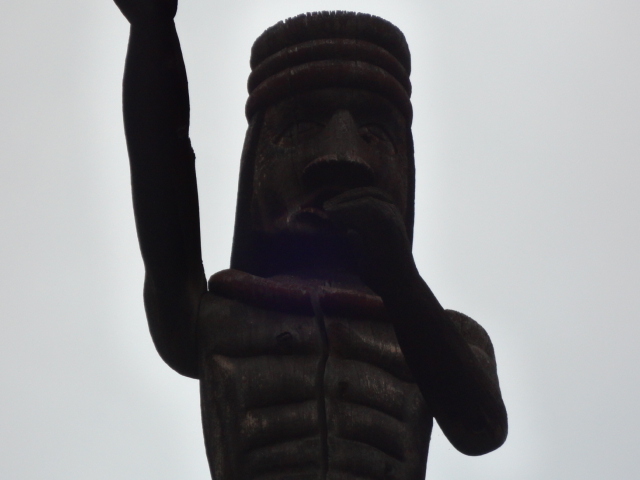 Although several totems were carved, only one remains on the island from Expo. 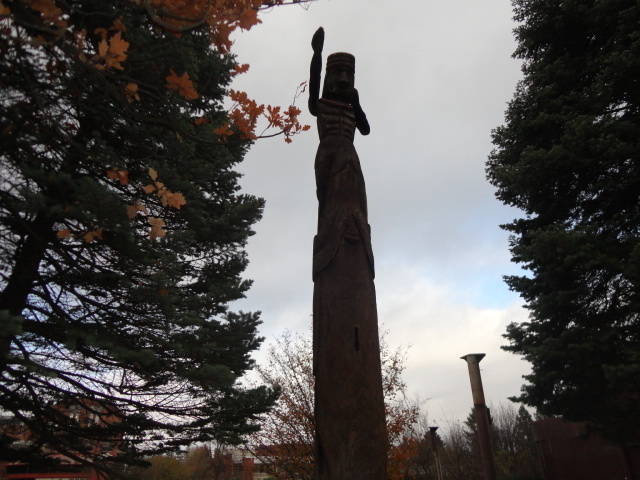 This cedar totem was only partially finished and features the figure of a man on top with one hand reaching for the sky. Another totem was added to the island in 1978 by the Inland Northwest Wildlife Council for its annual Bighorn Outdoor Adventure Show. This totem features an eagle spreading its colorful wings at its peak. While the totem built for Expo has a clear environmental theme, the second totem's meaning is unknown. Currently, the INWC, who undertook a refurbishing project in 2010, is trying to gain some information about the meaning of the pole so a plaque can be added describing why the totem was built and by whom. The totem poles on Canada Island continue to remind Spokanites of the people who lived here for millennia before the first settlers arrived. They remind us that before there was a city, there was only the falls, and a people that depended on them to survive. 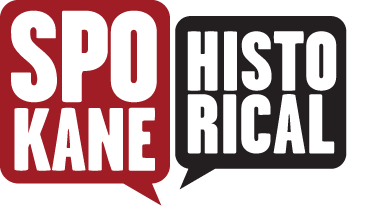 Cory Carpenter, “Totem Poles of Canada Island,” Spokane Historical, accessed April 21, 2019, https://spokanehistorical.org/items/show/386. Bannach, Chelsea. The Spokesman Review. 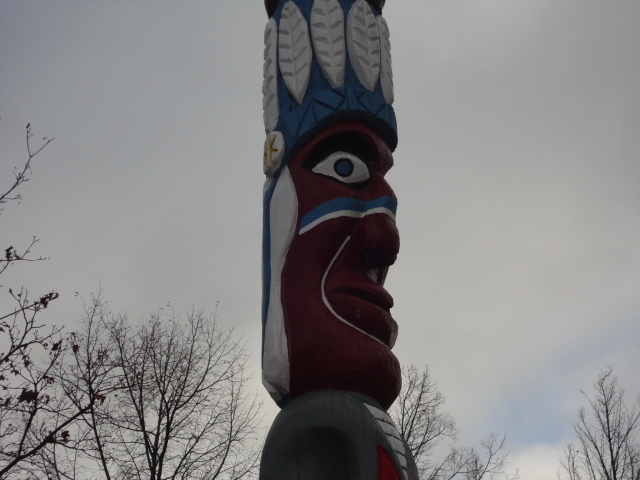 "Riverfront Park Totem Gets a Makeover," 22 October, 2010. Bowers, Dawn. Expo '74 World's Fair Spokane (Expo '74 Corporation, 1974). Stewart, Hilary. Looking at Totem Poles (University of Washington Press, 1993). Youngs, J. William T. The Fair and the Falls: Transforming an American Environment (Eastern Washington University Press, 1996).